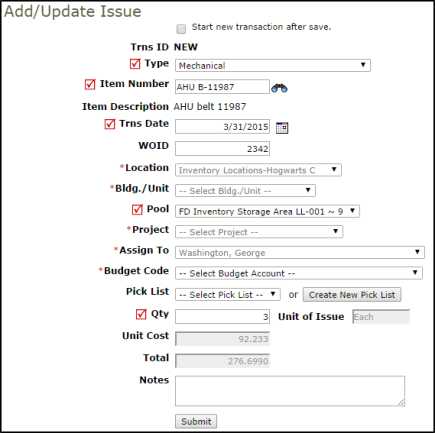 Issue transactions are created whenever you fulfill a user's request for items from your inventory. The amount and cost of the items issued will subtract from your total on-hand quantity and cost of that item. Required fields are indicated by a red check box . Issue Transactions can also be created directly from a work order in Work Order. Entering an New Issue Transaction in the Transaction section of a work order will automatically create an Issue in InventoryEdge. Any Work Order user that has access to enter transactions on the work order can perform this action without being a user in InventoryEdge. If you are issuing this item for use on a work order, enter the WOID. This will populate the Location, Bldg./Unit, Project, Assign To and Budget Code fields automatically with the information from the work order. An Issue transaction will also be recorded in the Transaction section of the work order. If you are not issuing this item to a work order, you can select Location, Bldg./Unit, Assign To, and Budget Code as needed.